If you are already in Los Angeles on a cruise of MulhollandDrive, take a detour to Hollywood Blvd if you really want to feel alive. There, near the corner of Hollywood and Gower St, is the Museum of Death. It was established in June 1995 by J. D. Healy and Catherine Shultz with the museum's stated goal being "to make people happy to be alive". 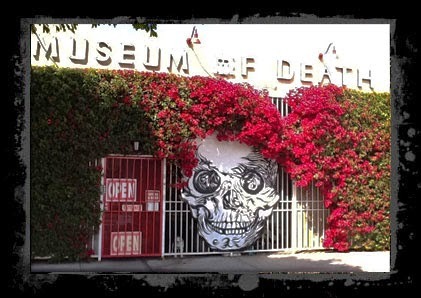 The Museum of Death is a self-guided tour, lasting approximately 45 minutes to an hour, but those who can stomach it stay as long as they like. The Museum of Death houses the world's largest collection of serial murderer artwork, photos of the Charles Manson crime scenes, the guillotined severed head of the Blue Beard of Paris (Henri Landru), original crime scene and morgue photos from the grisly Black Dahlia murder, a body bag and coffin collection, replicas of full size execution devices, mortician and autopsy instruments, pet death taxidermy, and so much more!